1) Send at least one member from your Optimist Club to the District Convention on August 25-27. Your club president has a seat on the board of directors. Her counsel is needed to guide our district. Your club president-elect is invited to attend an orientation and officer-elect training in order to get ready for the new year that begins on October 1. Why not send both of them? Ask Ed to learn more. 2) Add three new members to your Optimist Club before September 30. New members inspire us all to do more. Don't you want to experience their new-found optimism? 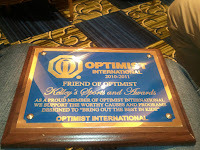 3) Add at least one Friend of Optimist to your club roster. Find out how easy it is to do and then go the distance by adding 20 and getting a personal visit to your Optimist Club from Optimist International President Danny Rodgers. Can you do it? Of course you can! The kids are counting on you.